File size 11 Mb Searchable PDF document with bookmarks. The Mitsubishi Sirius or 4G6/4D6 engine is the name of one of Mitsubishi Motors' four show of inline 4 automobile engines, along with Astron, Orion, and Saturn. The 4G6 are gasoline engines, the 4D6 diesels. The 4G61 displaces 1595 cc (82.3 x 75.0 mm bore/ full length stroke). This engine was not always DOHC 16-valve and used either Multi-point (MPFI) or Electronic Control (ECFI) fuel shot. A turbocharged version was also produced for the Mirage and Lancer. The 4G61 does not have balance shafts like the other 4G6x motors. Instead, it has separate components, some of which can be used on the "Silent Shaft" engine. The bigger 1.8 L 4G62 had been an SOHC 8-valve unit for longitudinal rear-wheel drive and all-wheel drive use. With an 80.6 x 88.0 mm bore / stroke, it displaced 1,795 cc. It was available either in carburetor form, multi-point fuel shot, or ECI Turbo as found in the Lancer EX 1800GSR or 1800GT, and Cordia GSR. Known as the "Sirius Diesel", the 4D65 had the same sizes as the 4G62 (1,795 cc). It was available either naturally aspirated or turbocharged, and was used in most Mitsubishi diesel passenger cars in the eighties and beginning of the nineties. The 4G63 was a 1997 cc variation. (85 mm bore x 88 mm stroke) SOHC and DOHC had been produced. Both versions were available in either naturally aspirated and turbocharged form. For front-wheel drive applications, the turbocharged Sirius' name was modified to "Cyclone Dash". As fitted to the fifth generation Galant 200 PS (147 kW) JIS gross were claimed - the output claims afterwards shrank to 170 PS - for the turbocharged and intercooled "Sirius Dash 3x2 valve" engine. This version could switch between breathing through two or three valves per cylinder, to combine maximum top-end power with low-end drivability as well as allowing for economical operation. The DOHC variation had been introduced in 1987 in the Japanese market Galant, and came in turbocharged or naturally aspirated form. It is found in various models including the 1988-92 Galant VR-4 and the U.S. market 1990-1999 Eclipse, as well as the Mitsubishi Lancer Evolution I-IX. Later versions also received Mitsubishi's variable valve-timing system, Mivec. A SOHC carbureted eight-valve version (engine code G63B) had been also available in Mitsubishi's pickup trucks (L200, Strada, Mighty Maximum, Dodge Ram50, etcetera) from the eighties until the mid-nineties. It produces 92 hp (69 kW) at 5,500 rpm in European trim (1989). 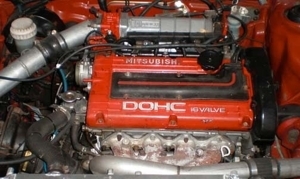 The SOHC version was also used in Mitsubishi Galant models until 1993. It has 76 kW of output and 157 Nm of torque at 4,750 rpm. Also, a SOHC version was produced until the belated 90s and early 2000s and was used in Mitsubishi cars like the Montero and the 2.0L 2-door Pajero with an production of 101 kW (137 PS) at 4,700 rpm. Additionally the N33 and N83 Spacewagon and Galant (UK market) received the 4G63, in single-cam sixteen-valve format. A similar version, with 100 PS (74 kW), had been additionally used in some light duty Mitsubishi Canters from 1997 on. The Mitsubishi Eclipse, Eagle Talon and Plymouth Laser introduced the DOHC turbocharged intercooled version to the U.S. in 1989 through Diamond celebrity Motors, a joint venture between Mitsubishi Motors and the Chrysler Corporation. From 1990 to late April 1992 came beefier connecting rods and the use of six bolts to protect the flywheel to the crankshaft; May 1992 to 2006 Evolution versions have much lighter rods and use seven bolts to protect the flywheel to the crankshaft. They are referred to as the "six bolt" and "seven bolt" engines, correspondingly. Production for the 2003 US Mitsubishi Lancer Evolution is 271 hp (202 kW) at 6500 rpm with 273 lb·ft (370 N·m) of torque at 3500 rpm. It has a cast iron engine block and aluminum DOHC cylinder head. It makes use of multi-point fuel injection, has 4 valves per cylinder, is turbocharged and intercooled and features forged steel connecting rods. Its turbocharged variant, 4G63T (also occasionally referred to just as the 4G63), has powered Mitsubishi vehicles in World Rally Championships for years in the Mitsubishi Galant VR-4, Lancer Evolution, Carisma GT and Lancer WRC04. It was the powerplant of the Lancer Evolution when Tommi Mäkinen won his four straight WRC championships in his Lancer. MHI and T-4 turbos were both used as power plants for these engines. Known as the "Sirius Diesel", the 4D68 version displaced 1998cc. It was fitted with a 93mm stroke crankshaft and the cylinder bore diameter was 82.7mm. This engine used pistons with a static compression ratio of 22.4:1 and piston pins were 25mm OD. It had been available either naturally aspirated or turbocharged, and replaced the 4D65 as Mitsubishi's "go-to" diesel. The 4G64 is the second largest variant, at 2,351 cc. Early models were 8-valve SOHC, but an afterwards 16-valve SOHC and DOHC version was also produced. All utilized MPFI and had an 86.5 mm bore and 100 mm stroke. The 4G64 was later also available with gasoline direct injection. Output varies between 145 hp (108 kW; 147 PS) at 5,250 rpm with 161 lb·ft (218 N·m) of torque at 4,000 rpm in the Mitsubishi L200 and 152 hp (113 kW; 154 PS) at 5,500 rpm with 162 lb·ft (220 N·m) of torque at 4,000 rpm in the Chrysler Sebring/Stratus. The Chrysler version qualities fracture-split forged powder metal connecting rods. The 4G64 is an interference motor like the 4G63, however, the early 8-valve 4G64 is a non interference engine. From March 1996 an LPG variation with 115 PS (85 kW) at 5,000 rpm was available in the Mitsubishi Canter. The 4G69 is a 2378 cc version built in Shiga, Japan. Bore is 87 mm and stroke is 100 mm. Output is actually 162 hp (119 kW) at 5750 rpm (160 in the Sportback Wagon) with 162 lb·ft (219 N·m) of torque at 4000 rpm. It has a cast iron engine block and an aluminum SOHC cylinder head. It utilizes multi-point fuel injection, has 4 valves per cylinder with roller followers and features forged steel connecting rods, a one-piece cast camshaft, and a cast aluminum intake manifold. The 4G69 incorporates Mitsubishi's MIVEC Variable Valve Timing technology. The 4G69 is an interference engine like the 4G63. NB: From 2005 a slightly detuned variation (115 kW, 220Nm) is actually used across the entire Lancer range in Australia.